The iconic and patented MB200 has arrived! The MB200 is the premier mini bike on the market today - quality, affordable and easy to operate. Rev up your adventure-filled weekends with speeds up to 24 mph! Powerful 200cc four-stroked, air-cooled engine surpasses virtually any other mini bike on the market! Dual front suspension cushions the ride while the large and wide off-road tires increase ground clearance and improve traction. Forget about all of your constant refueling worries because this bike has a large capacity fuel tank! The MB200 arrives to your doorstep pre-assembled - add some gas, attach the handle bars and you'll be on your way to a legendary and picturesque holiday season! The MB200 comes with a 6 month parts and labor warranty. Minimum age recommendation is 16 years old. Always wear a helmet and follow recommended safety regulations when riding. Off-road use only. This product is regulated by state and Federal government agencies. It is the responsibility of any rider of this vehicle to be familiar with and fully comply with all laws, rules and regulations governing the operation of this vehicle. Laws vary by jurisdiction. We are currently unable to ship to California buyers. We apologize for this inconvenience. Proudly Assembled in Garland, Texas USA! POWERFUL, AFFORDABLE & EASY TO OPERATE - Arrives to your doorstep pre-assembled - add some gas, attach the handle bars and you'll be on your way. Trouble-free set up and built to last! BIGGER & BETTER THAN IT'S COUNTERPARTS - Strong 200cc four-stroked, air-cooled engine surpasses virtually any other mini bike on the market. 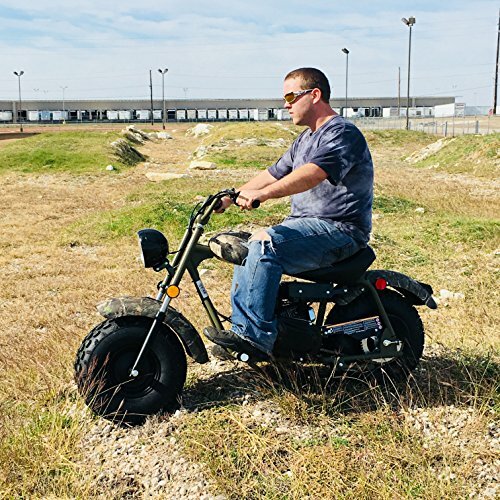 This deluxe-sized mini bike effortlessly accommodates teens and adults up to 200 lbs! Forget about all of your constant refueling worries because this bike has a large capacity fuel tank! COMFORT, STYLE & FREEBIES - Dual front suspension cushions the ride while the large and wide off-road tires increase ground clearance and improve traction. Classic looks paired with an easy usability make this mini bike an American legend. SAFETY MEASURES - Chain guard, exhaust heat shield, engine stop switch. WARRANTY - All Massimo MB200 Mini Bikes come with a 6-month parts and labor warranty. There are hundreds of Massimo service centers located across the country for you to choose from! If you have any questions about this product by M MASSIMO MOTOR, contact us by completing and submitting the form below. If you are looking for a specif part number, please include it with your message.